It's no question that one of the Xbox 360's major exclusives for 2009 will be Forza Motorsport 3. The Forza series has always been a favourite amongst racing game fans and this latest installment looks to continue in this tradition. Today new details were announced regarding a pre-order car and the Limited Collector's Edition version of the game. 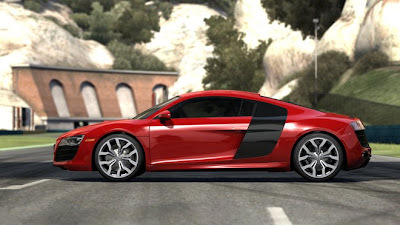 If you pre-order the game, you will receive a custom painted Audi R8 V10. In fact, this is a special custom painted car from Forza community member Justin Van Dusen II. Justin's design was selected as the best car design by community members with approx. 300,000 votes. Turn 10 will also create a number of special designs and tune kits for VIP members. This certainly seems like a nicely packaged Collector's Edition and will no doubt have many fans looking forward to its release on October 27th. Certainly looks like a strong pre-order package. It's a good mix of physical and virtual goodies. What would really put this deal over the top is a discount coupon for the Microsoft racing wheel!